Following my visit to Minturnae (see previous post here), I continued my journey north along the Appian Way to reach Terracina, a picturesque town on the Tyrrhenian coast situated approximately half-way between Rome and Naples. Legend has it that Odysseus sailed here on his travels and surrendered to Circe’s enchantment. Circe is said to have lived on Mount Circeo, a promontory stretching-out into the sea best visible from Mounte San’t Angelo above the town of Terracina. Nowadays the area is called the Riviera of Ulysses. After occupation by the Ausoni, Terracina was taken over by the Etruscans, followed by the Volsci in the 5th century BC who called it Anxur (the name of Jupiter as a youth -Iuppiter Anxur or Anxurus- god of the city) and made it a fortress against the Romans. In 329 BC, however, the city became Roman under the name of Colonia Anxurnas. It was later renamed Tarracina (a name probably derived from its Etruscan origin). A few years later, the Via Appia joining Rome with Capua was built, climbing to Tarracina on its way South. Like Minturnae, Tarracina experienced a long phase of intense building from the time of Sulla (c. 138 BC – 78 BC) to Trajan (ruled AD 98-117) and Antoninus Pius (ruled AD 138-161). Much of the acropolis development dates to the time of Sulla, including the Forum Aemilianum. It was named after Aulus Aemilius, a local wealthy man who ordered its construction. The present Piazza del Municipio lays over the ancient forum. Its pavement is well preserved and it is still possible to see the inscription ” A. Aemilius A. F. Stravi(t)” in letters which were once filled in with bronze (Aulus Aemilius paved this – CIL 10.6306). 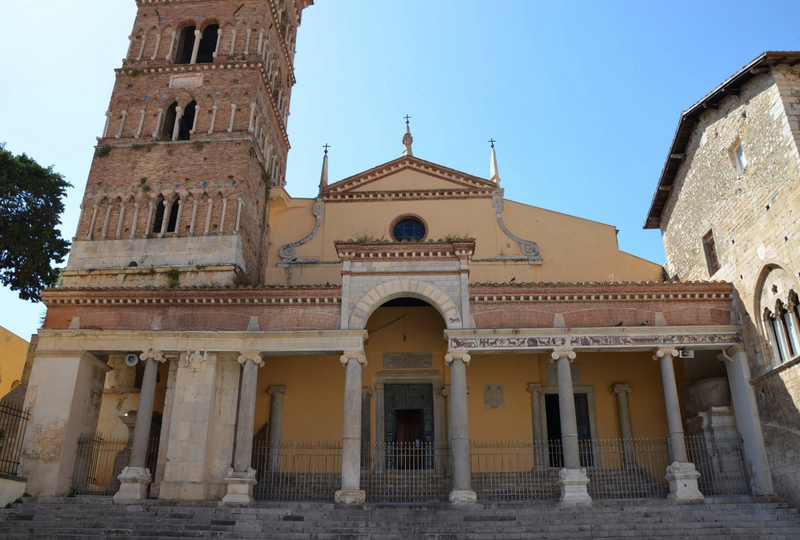 At the north end of the forum, the 11th century cathedral (consecrated to San Cesareo in 1074) is built upon the site of a temple identifiable as the Temple of Rome and Augustus whose column drums were reused in the building. A fine stretch of the Via Appia, which served as decumanus, is still preserved on the north side of the forum. The access to the forum was preceded by a quadrifrons (four-sided) arch, which served as entrance to the forum. One side of the arch was discovered inside a destroyed medieval building under which lays a well-preserved stretch of the ancient Via Appia. On the orders of Trajan, the Via Appia was brought down to sea level by cutting through the cliff along the coast. The Via Appia used to cross the hill at the back of the promontory by a steep ascent and descent. An attempt was made in 184 BC to get round it but it was probably not until early in Trajan’s time that a cut made in the Pisco Montano finally solved the problem (see image here). 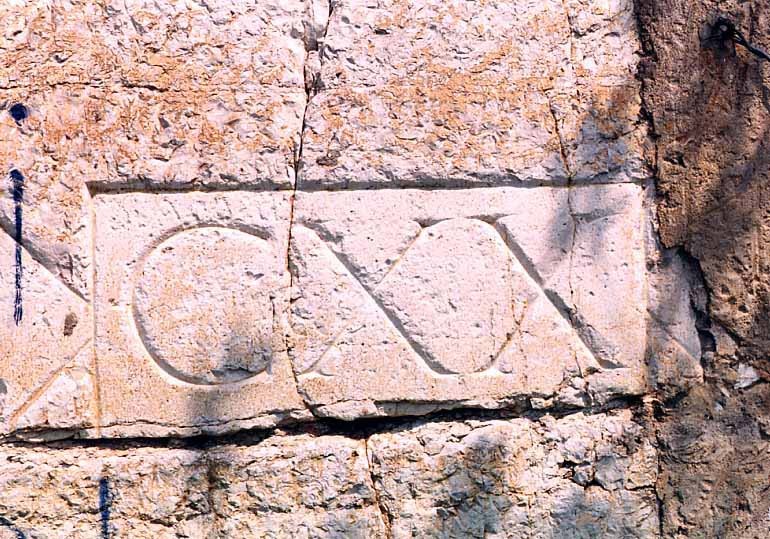 The depth of the cut is indicated by marks on the vertical wall at intervals of 10 Roman feet; the lowest mark, about 1 m above the present road, is CXX, corresponding to 36 meters. It was probably following the road cut that some of the most important buildings of the imperial period were erected in the lower town by the harbour (amphitheatre, baths, etc.). However little is now visible, and its site is mainly occupied by a new quarter built by Pope Pius VI. Little remains of the ancient harbour constructed by Antoninus Pius and the area has been largely silted up. Massive remains of another temple identified as the Capitolium (since it has a triple nave) lie next to Piazza del Municipio. Built іn opus reticulatum ca. 50-40 BC, the temple wаs dedicated tо the Capitoline Triad (Jupiter, Juno аnd Minerva). The temple was discovered by chance; in fact the site was brought to light only after the World War II bombings. Restored between 1946 and 1948, the Capitolium still preserves its high podium, part of the access stairs, a column in Tuscan-Doric style as well as the remarkable remains of the walls of the three cellas in two-coloured opus reticulatum. The cellas are 9.25 m long each and half as wide. Underneath a door leads to the favissae, the rooms where the votive offerings were kept. Another important public edifice was the theatre. It had a splendid natural background, the Tyrrhenian Sea and the sight of Mount Circeo. A statue of the Greek playwright Sophocles (the so-called Lateran Sophocles) was found amongst the ruins of the theatre. The statue was displayed in the Lateran Museum in Rome before being transferred to its present location in the Museo Gregoriano-Profano in the Vatican. The Sanctuary of Jupiter Anxur is perhaps Terracina’s most famous historical site. It dates back to the fourth century BC, though much of the development belongs to the first century BC at the time of the Roman general Sulla. Built on Mount Saint Angelo (known as Mons Neptunius in the Roman era), about 270 metres above sea level, the complex is large and spectacularly sited, dominating the shoreline and sea. From here one can admire the extraordinary panorama, which to one side gives onto Mount Circeo, on the other, onto the Fondi Plain. The best view of this sanctuary is from the sea or from the beach. If you are fortunate enough to be floating on a boat somewhere near Terracina, you will see, from a distance, the great substructures of the Sanctuary of Jupiter Anxur (see image here). The sanctuary was surrounded by a defensive wall and nine round towers built to keep the Via Appia under control and as well as to keep Sulla from advancing onto Rome during the wars between Marius and Sulla. The temple has long been assumed to have been dedicated to Jupiter Anxur (Jupiter the young) who was the city’s protector, although recent studies and discoveries of votive objects attribute it to Venus. The most impressive remains are those of the underground passageway, the cryptoporticus, resting on twelve massive arches in opus incertum on the south and west sides. The sanctuary was built on a number of terraces. Above the cryptoporticus stood the place of worship, the principal temple, as well as the favissa (votive deposit) and the rock of the Oracle. Only the high podium of the temple remains. The temple was reached by a flight of steps at the center. The cella was almost square while its outer walls carried six engaged Corinthian half-columns; a deep porch with six columns along the front and four down the sides (see reconstruction below). The upper terrace with its U-shaped ambulatory (see reconstruction below) was used for military purposes. The area was kept under control by a contingent of 80 soldiers led by a centurion. The soldiers stationed here had a separate life from the sanctuary but a small temple in antis was built for their religious needs. 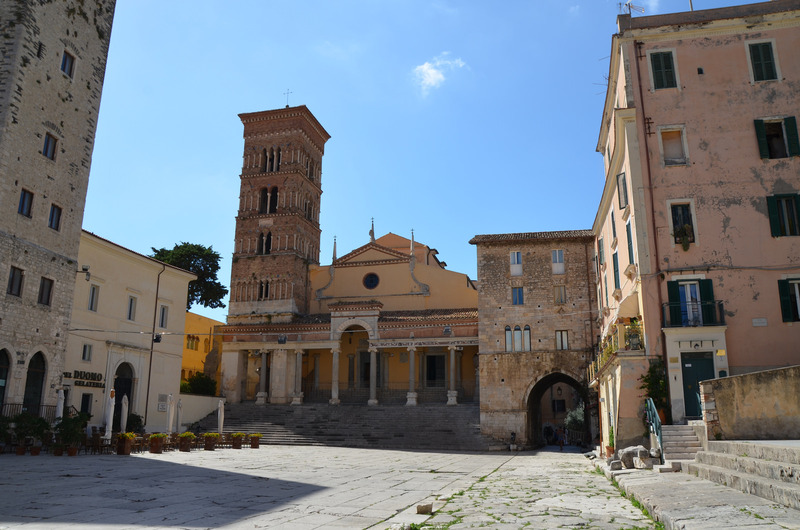 Further images of Terracina can be viewed from my image collection on Flickr.